There are players on the planet who can change a game. Then there are players that invent new ways to play it, creating unbelievable moments that turn the game on its head forever. The FUTURE is made for those players that change the game in an instant, those that play with instinct, and invent play on the pitch pushing the game to New Levels. That’s why PUMA designed a boot that allows for complete individuality in both fit and style. To further enhance the overall fit and feel of the boots the NETFIT upper has been fused to the evoKNIT sock and striking zones to create one form-fitting textile base layer, bringing the wearer a snug-fit whilst making sure the foot is closer to the ball on impact for that perfect touch. The evoKNIT sock has been designed to be non-restrictive and allow for limitless agility thanks to its specifically placed cuts, whilst the material itself offers supreme support and comfort throughout the game. The FUTURE also introduces the brand new RAPIDAGILITY outsole, made of super lightweight and reactive Pebax, and contains a mix of conical and bladed studs that are designed to bring the best results in traction and stability. 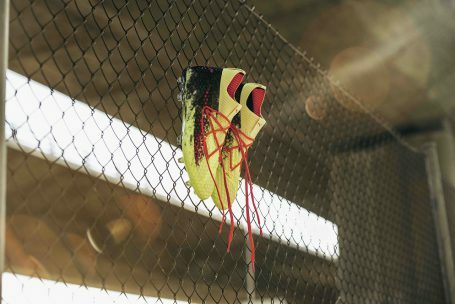 Perfect for those quick turns of pace, and moments of quick footed brilliance that leave your opponents in a twisted heap. The Q1 FUTURE 18.1 comes in a disruptive yellow and black graphic execution that echo’s the explosion of energy felt when those outrageous moments of brilliance come off, sparking off flares in the stands and scenes in the streets. The release of the FUTURE 18.1 release is accompanied by a campaign film created by the 2017 UK Music Video Award winning director Ryan Staake and featuring Antoine Griezmann with music provided by the king of Afrotrap ‘MHD’ in the form of the track ‘AFRO TRAP Part.7 (La Puissance)’. The FUTURE will be worn by players such as Antoine Griezmann, Adam Lallana, Marco Reus, Jozy Altidore and Marko Arnautovic.